Power Kush: High yields and exceptional strength in 50 days of flowering! If you cross two successful strains like Critical and OG Kush, the result is most likely to be very powerful in growth, high yielding, and incredibly potent. This is why Zambeza Seeds decided to name this variety Power Kush. Basically, that’s what it is. The genetic influences from the high-efficiency strain Critical are responsible for the very fast and vigorous growth. Ocean Grown Kush, also known as OG Kush, is one of the most influential strains from the West Coast of the US. This blend of the best genetics from Europe, enriched with highly potent genetics of OG Kush, manages to satisfy its growers and smokers on many different levels. The growing characteristics are leaning more towards a typical Indica, with a short flowering time of only 50 days, and plants not being taller than 60-80cm indoors. This variety shows its sativa-dominance more when evaluating the effects. Power Kush can also be successfully grown outdoors or in a greenhouse, where plants usually reach heights of 120-170cm. When regarding the final yields, it gets clear that we are talking about an exceptionally high-yielding variety. 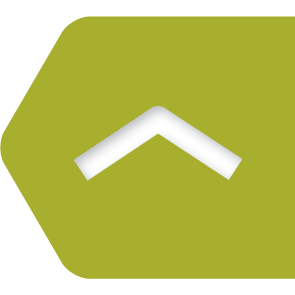 Indoor yields can peak at 475-525g/m², and outdoor yields are even more extreme, with 500-600g per plant. Besides very high yields, it is the flavour and effect that really speaks for growing this strain. Power Kush has a THC content of 20% and is therefore more suitable to the advanced smoker and cannabis connoisseur. The great thing about the effect is that it combines deep relaxation and enhancement in creativity. This makes Power Kush also suitable for daytime use, even though true Kush lovers will prefer to smoke a powerful variety like this at nighttime. Taste and flavours can be described as being rather sweet, blended with noticeable sour and spicy notes. Growers who would normally choose either Critical or OG Kush now have the opportunity to grow these two strains at the same time, by simply growing Power Kush. 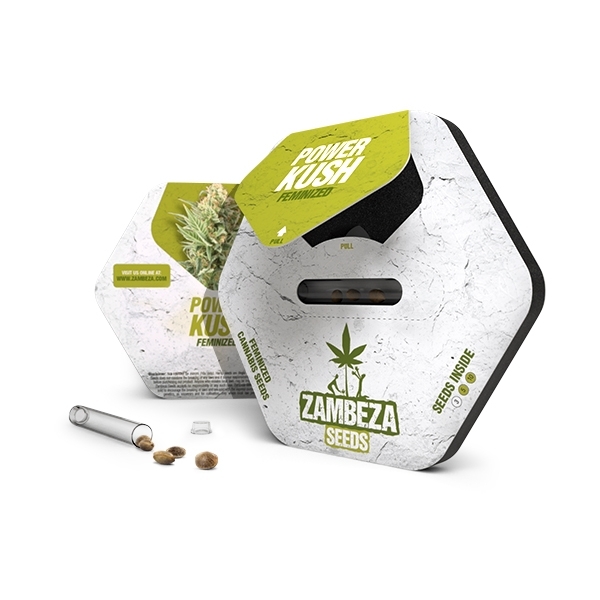 Zambeza have taken things to another level by enriching the heavy-yielding characteristics of Critical, with flavours and potency of OG Kush. The outcome is a strain that is so powerful, potent, and vigorously growing, there wasn’t any dispute about the name. Power Kush clearly has the potential to satisfy demanding Kush lovers who aim for high efficiency and a superior quality product. 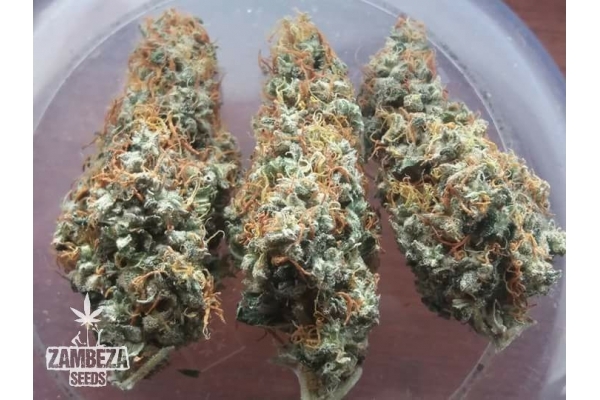 We from Zambeza Seeds are proud to be able to offer this strain at a great value, and ensure the high quality every grower of this magnificent plant deserves. Title : Molto buona e poco lunga. Comment : J ai planter cette variété en exterieur dans le nord de la france(lille),j ai pus récolté le 17 octobre 645 g sec ,sur seulement 2 plants, je suis très très satisfait pour un debutant.avec ce résultat obtenu je ne changerait plus de variété et je vais maintenant continuer a cultivé celle ci. Comment : Northern Lights...zuverlässig! Nach nur 3 Wochen Curing ein perfektes Aroma! 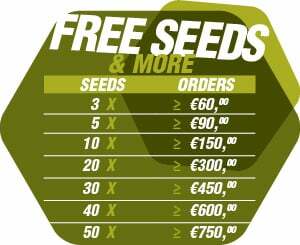 Comment : Easy to pay with debit , waiting for seeds.